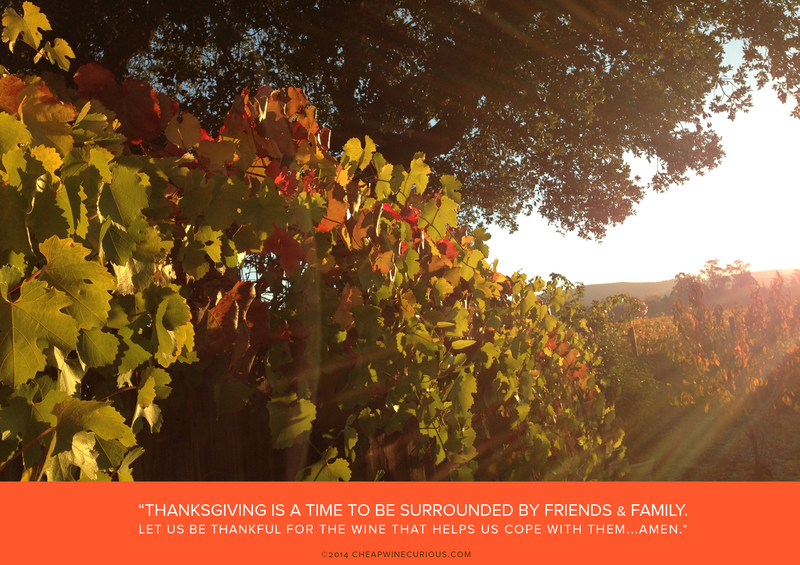 TOP 10 UNDER $10 : #Wine Suggestions For Thanksgiving! Golly! Is it really Thanksgiving time already? I just got out of recovery from Halloweek and without missing a beat, we are off planning the big Turkey trot. I have never hosted more than a Taco Tuesday but have logged many hours assisting a hapless host on this most notorious of American holidays. Hosting is a performing art typically reserved for the patriarch &/or matriarch of the family. When not in the homeland, the stage is kindly set by a friend who has a few extra seats at their folding table and a tolerant extended family too enthralled with football to succumb to social awkwardness. Ahhhh, the memories. And when the police have left to have dinner with their own families, and the dishes are dried, the pie put away and bail has been posted for that gregarious uncle who got a little carried away, we tuck ourselves in for the night and give thanks for the wine that got us through it. This holiday you will be tasked with making wine selections for an array of occasions. Hostess gift, friendly gathering, family affairs, work events and after parties of one. Sure, sure, sure. Who wants to look gauche by bringing cheap wine to a party – the horror! Then again, who realistically can serve unlimited bottles of fine vintages for hundreds of guests other than your wealthy relatives – actually, they won’t be either. Cheap is chic! Living well doesn’t mean living expensively. Sharing those special splurgy vintages with winos who can appreciate it is much different than ensuring your Great Aunt Helen enjoys that glass of quaffable red that puts some color in her cheeks. And if the hostess is a snob, then rise to the occasion and bring a respectable wine, but I don’t know a wino who doesn’t appreciate a good tip and a smart deal every now and then. Hey, every bottle does not find a place in the cellar, they often end up at the next party or in the fridge….yes even the reds! After 6 months of mining the bottom two shelves for the most delightful of deals, I present my 2014 top 10 wines under $10 USD. I urge you to let me know if I’m full of giblets. If you violently disagree with any of these selections, please pipe up. I am not perfect and sometimes I’m swept away by the “conviviality” of the tasting. My first and foremost objective is to provide good guidance. Mistakes happen and when they do, better it be a value wine than a $78 bottle-o-fancy like the one I bought a few months ago. Oh, boy, was that a party. My fave! These guys sell a tonnage of this wine in Texas at HEB – the number one red wine sold currently. I love this wine because, every time I decant it, the flavor changes and is so smooth, enjoyable and guest love it. They ALWAYS comment on how good the wine is – this is red wine crack for guests. It is on the fruit forward side for those winos with a rarefied palate, but let me tell you, me likey and can’t image a dish (other than fish) that this would not complement. I would even venture to serve this with a rich chocolate dessert – outstanding! I’m finding that this brand hits it outta the park with its other varietals as well, so I’m gonna give them props for getting it right and making a red jammy whammy that pairs well with turkey smothered in rich gravy with a italian sausage stuffing. I think this would be great with lamb and any gamey flavorful meats. Prime rib would be a match made in heaven. I have bought this wine now 3x and enjoyed it more than I should.Crisp, not grassy like other NZ Sauvs and very citrusy acid without a trace of a sour aftertaste – eeeew – hate that. Pairs well with a turkey left over sandwich on sourdough, aioli, pepper, butter lettuce, tomato and let’s throw in a piece o’bacon for good measure. Oh, so delicate, delightful, it takes me to Provence. Not much more to say. Perfect for those guest ambivalent about white or red and want something light to complement their meal, not take over the show. The lightly roasted brussels sprouts will love this co-star as well as the harcourt verts and cauliflower au gratin. A little spice makes this light and lovely Pinot a friendly accompaniment to yams, sweet potatoes and fluffy dressings. Baking spices will linger with each sip after every bite. The bold richness of this wine will definitely pair nicely with the heartier foods on the table. Cheesy potatoes au gratin, crusty olive loaf bread and onion tartes. Turkey lovers will enjoy the mingling flavors when this is paired with buttery mashed potatoes and rich brown turkey gravy. I think this Merlot is a great starter wine to get the appetite going. Serve this with hors d’oeuvres, olives, bold cheeses, charcuterie and mon rêve: a creamy, dreamy Emmental and Gruyère fondue – ahhhh go big or go home. For those guests who want white wine, this is a crisp but hearty white that helps keep the palate cleansed between bites and finishes nicely with roasted potatoes and veggies drizzled with butter, spices and a little balsamic. Perfect match for asparagus and hollandaise. A shockingly good Cab whose price per bottle is less than a latte. Easy drinking once it breathes for an hour and lovely paired with a bite of turkey and cranberry sauce. The fruit and the tannic spice will enhance the succulent flavors and spices of your Thanksgiving dinner. A lighter red that will pleasantly build on the flavors of rich gravy, buttery potatoes and savory dressing. This wine will cut the richness and finish strong without an overwhelming boldness. Most of these wines are widely available at Safeway, Von’s, TraderJoe’s, WholeFoods and various national grocery chains. If you must search further, I suggest going to WineSearcher.com which is a great resource for finding wines in your hood. If you can get a hold of #1 – tell me what you think…decant and serve to your guests and see if they compliment you on your wine selection 😉 I got your back! I am intrigued by the Lodi red blend. It sounds good and I am heading to Central Market (an HEB store like Whole Foods on steroids) this afternoon. Hhhmmm…. SCORE for you. The Lodi region is solid so I imagine it is a good wine. I need more wine like a need a hole in my head but for you sweet friend I will buy and try! Cheers. Great list! Good to know that a TJ Merlot pairs well with your dream fondue (although those cheeses were not cheap!). Road trip to Lodi my next trip out? Yes! I have many o friend out in Lodi now….the cheap-wine country awaits.